First Observational Evidence Other Universes? In the realm of far out ideas in science, the notion of a multiverse is one of the stranger ones. Astronomers and physicists have considered the possibility that our universe may be one of many. The implications of this are somewhat more fuzzy. Nothing in physics prevents the possibilities of outside universes, but neither has it helped to constrain them, leaving scientists free to talk of branes and bubbles. Many of these ideas have been considered untestable, but a paper uploaded to arXiv last month considers the effects of two universes colliding and searches for fingerprints of such a collision of our own universe. Surprisingly, the team reports that they may have detected not one, but four collisional imprints. The team, led by Stephen Feeney at the University College London, considered a collision between bubble universes. They conducted a simulation based on a formulation of Einstein’s field equation, known as de Sitter space. This solution to Einstein’s equations is essentially a description of how space itself behaves. 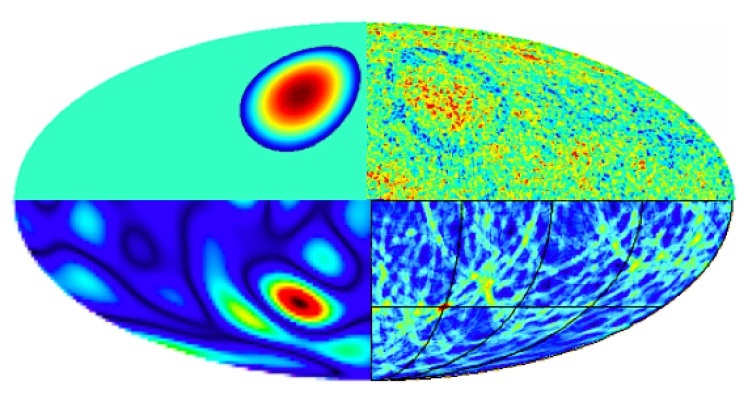 From interactions between such spaces, they determined a set of observable effects visible in the cosmic microwave background (CMB). Among them, they required that signals have azimuthal symmetry or are mirrored on both sides of the sky. Secondly, the signals should be circular in shape. Searching the WMAP archives, the team found numerous possible signals, but eventually narrowed it town to four strong candidates. The authors of the paper are quick to caution that these results are only consistent with the predictions of bubble universes but do not rule out other causes, or even simple blind luck from a large enough data set. To rule out other scenarios, astronomers will need to rely on instruments with higher sensitivity, such as the Planck satellite, launched in 2009, which working on completing a second scan of the entire sky with three times the sensitivity of WMAP. ‹ PrécédentPremières preuves d’observation d’autres univers…à part notre univers connu? Suivant ›Les poissons-chats tropicaux plus d’espèces à sauvegarder que prévu!